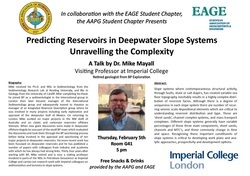 Visiting Professor at Imperial College London, Dr. Mike Mayall, presented a compelling summary of the most critical features of deepwater slope systems when considering reservoir targets. 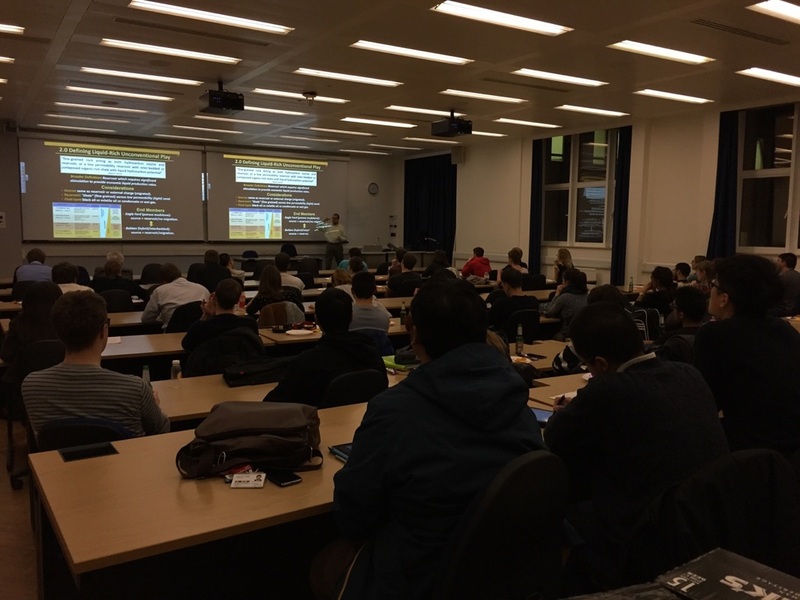 The talk, received by over fifty students, shared a tidy synthesis of ‘sheet sands’, channel complex systems and mass transport complexes (MTC’s) – the three most significant depositional elements of slope systems. Sequentially, illustrations of the seismic properties and geometry of each depositional element succinctly tied in with depositional models of their formation. Sheet sands, the product of multiple processes on the slope and basin floor, and channel complex systems were both described for their reservoir potential. 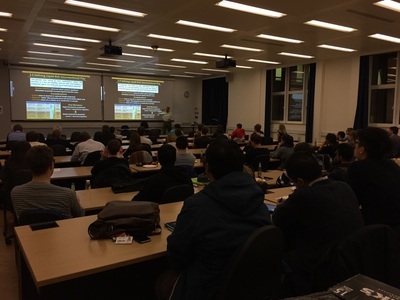 Mass Transport Complexes – specifically not referred to as the tautologous ‘Mass Transport Deposit’, as Dr. Mayall amusingly pointed out – were noted as being of poor reservoir quality, clarifying ambiguity for some in the audience. MTC’s were included in the talk for their volumetric and stratigraphic significance in the deep marine. The presentation went on to identify how salt-derived extreme topography in slope environments can dominate the geometry the slope depositional elements, most notably channel complex systems, with examples from the West African continental margin. These examples, and many others, included stunning images illustrating the vanguard of seismic attribute capabilities. 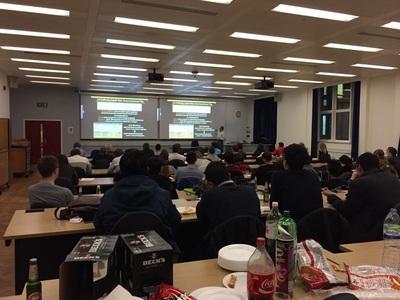 The talk concluded with auspicious applications of the presented content, which many of the students will no doubt take to industry or further research. A gathering of inquisitive students after the formal presentation learned of the near-essential power of amplitude maps when interpreting these systems. 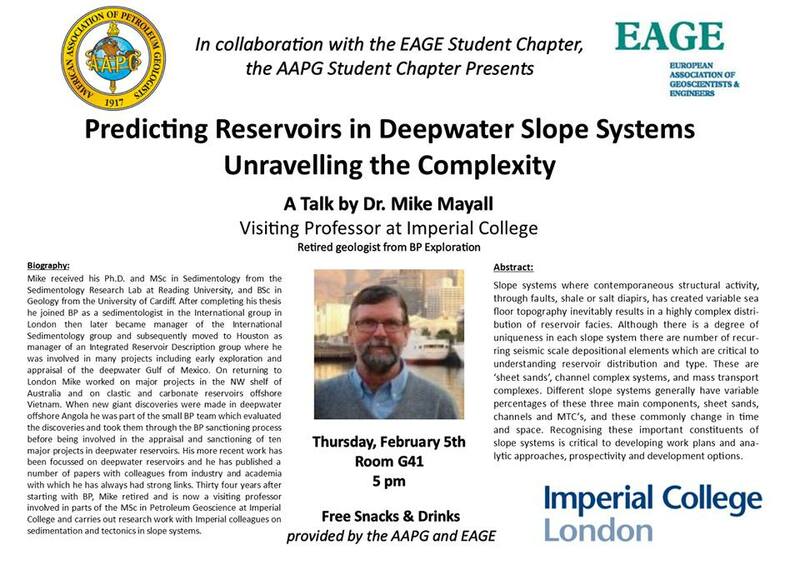 With this came mention of the necessity of accurate seismic picking, which when carried out with peak-amplitude auto-tracing may ‘jitter’ the final image more so than smoothed-out manual picking; amiably personal tips shared from Dr. Mayall’s long career at BP! 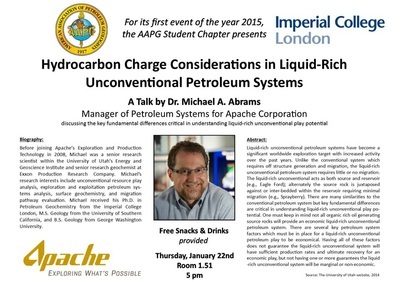 As the first AAPG Student Chapter event of the year 2015, Dr. Michael Abrams, manager of Petroleum Systems for Apache Corporation, gave a riveting talk on Liquid-Rich Unconventional (LRU) Petroleum Systems. The lecture discussed the key characteristics of a successful LRU play from a geological point of view but, most importantly, from an economic point of view. Relating to the current petroleum industry economic climate, and boding well with the academic program for both undergraduates and postgraduate students, the event was received with enthusiasm and experienced a great turn out. The parameters that control the economic success of a LRU play are mainly related to the type and amount and type of organic matter present in the source rock as well as the source rock maturity. However, not all organic-rich generating source rocks will provide an economic petroleum system. Of the oil generated, considerable amounts could be retained, therefore hydrocarbon storage and flow capacity, which are intrinsically related to the physical characteristics of the source rock and fluid properties, have a great impact on producibility. Finally, the fracability of the source rock, related to the regional stress regime and to the rock brittleness, is fundamental for drilling and completion. Dr. Abrams recommends future research focusing on in-situ organic matter measurements, more quantitative evaluation of maturity and better understanding of retained hydrocarbon related to organic-matrix interaction (organic porosity). Due to the particular nature of LRU systems, measurements of the producible hydrocarbons must be favoured instead of concentrating only on the volumes in place.